With the Super 106 Cup a distant memory (and a stupid idea!) I happened to be driving home one January evening, through the chalk-cutting on the A5 near Dunstable, when I glimpsed a rally car sat in a garage showroom?!?!? I u-turned at bit further down the road, and wnet for a ganders. 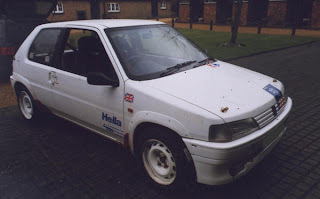 Turned out to be a clubmen Group A Peugeot 106 Rallye Series 1, 1294cc. Mmmm, interesting. Turned out the car was there as a favour for the guy who looked after it, for the man who owned it. Not knowing what to do with it, I thought the best thing was to go to Vision's stage again, and have a practice - much to Dave Nutts annoyance, as he kept telling me to 'just go and do a rally!" 10 minutes later we are heading towards a concrete fence post at 60mph, when Dave pulls the handbrake so we go in backwards ripping off the rear bumper - good start! So its a quick repair before our first event (eh???) which we decided to do at Snetterton circuit in February. Well after smacking it on the gravel airfield, maybe I will be safer on tarmac for a while?? ?